Learn the art of making Wagashi, the traditional Japanese sweets served during the tea ceremony by a Certified Nerikiri Art Instructor. 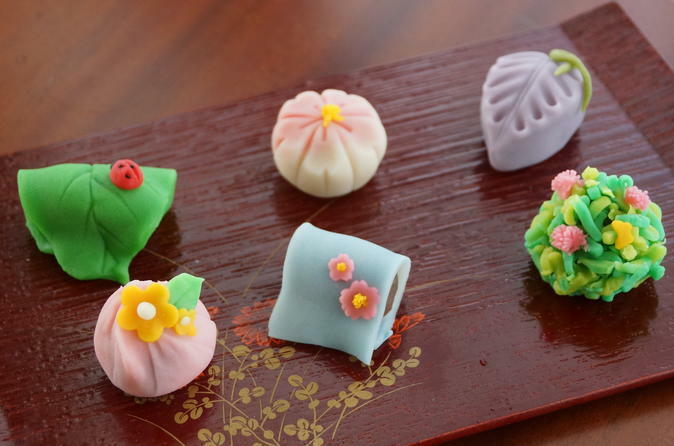 This 2.5 hour course will teach you how to make the dough for the Wagashi and then go on to coloring and shaping the dough to make a seasonal motif. At the end of the course you will be able to taste the Wagashi with a bowl of Matcha, green tea. This class can be combined with a Mochi making class upon request. In which case, you will be making 2 nerikiri wagashi, 2 strawberry daifuku and tofu warabi mochi. (Other fruit will be used in case strawberries are unavailable). The class takes place in a private home located within walking distance from Meguro or Gotanda Station of the JR Yamanote Line or the metro station. You will be greeted by the instructor who will start off by making the nerikiri dough, which is the basis of all nerikiri wagashi. If the mochi combination course is chosen, you will be making tofu warabi mochi and strawberry daifuku mochi at the beginning of class. Next, the instructor will demonstrate how to make a seasonal motif, where you will have a hands on experience of shaping your own wagashi. In the class you will be making two kinds of wagashi (two of each) which you will be taking back. The class will conclude with tasting the wagashi with matcha green tea. All materials are plant-derived and no meat, seafood or eggs will be used.